Let me start off by saying, I don't like the idea of God being my number one priority in life. 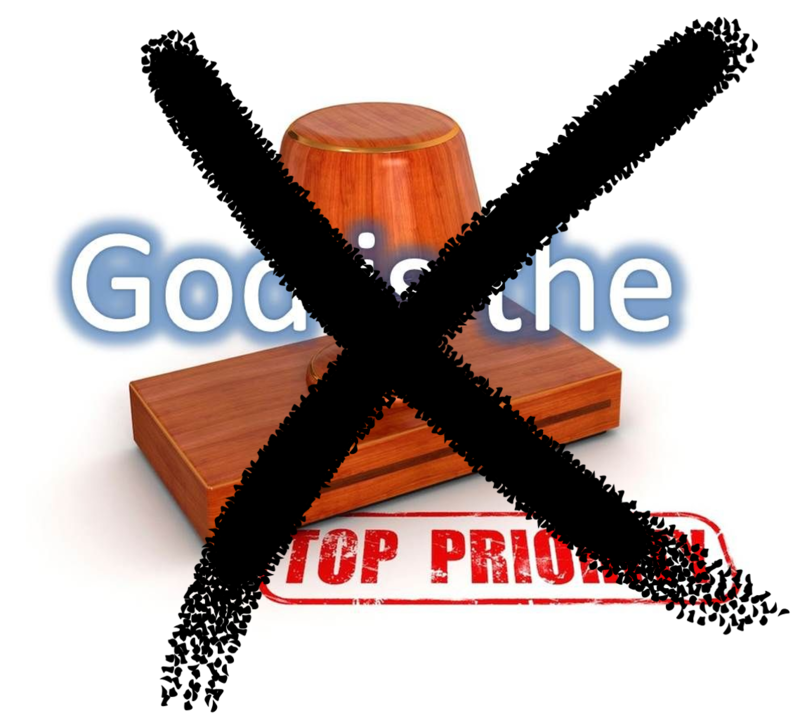 In fact, God should not be a priority at all, as far as I'm concerned. I say this with strong conviction and without shame. 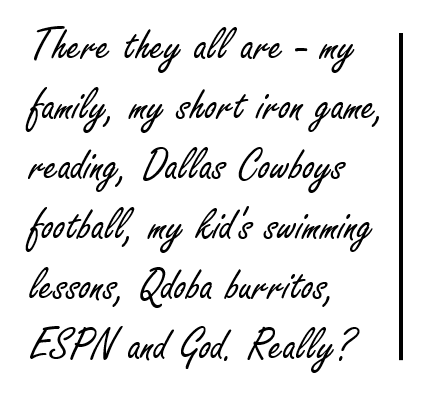 I have said this publicly for years in spite of the fact that most audiences to whom I speak it believe strongly that God is, and always should be their number one priority. I pray my children come to understand this. 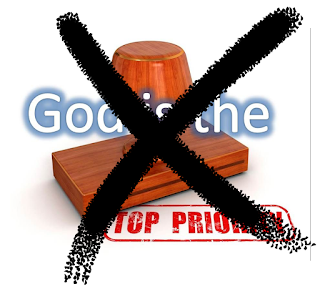 God is not a priority. Anyone believing such nonsense should abandon their faith immediately. You see, if God is my number one priority, what is number two or three? What are numbers four through fifty? And when I am working on, and giving full attention to, say, priority number twelve, where is God then? Does God just take a back seat? Is God just another one of many competing priorities to be clumped together and sorted alongside others of my life's priorities? 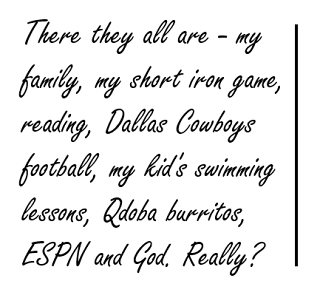 There they all are - my family, my short iron game, reading, Dallas Cowboys football, my kid's swimming lessons, Qdoba burritos, ESPN and God. Really? No! God is not a priority in life! God -------------------- is -------------------- life! With God as our top priority, we can remain ceremonially Christian. We go to church, give some money (slightly less per year on average than we spend on dining out), offer some prayers, host a small group, do an annual service project and attend a Bible seminar. This mask hides our inactivity when it comes to caring for the alien, the fatherless and the widow. It provides the cover we need to ignore our call to win the lost and set the oppressed free. We simply point to our religious activity. We tithe mint and dill and cumin, but ignore more important matters of justice and mercy and compassion. We strain a gnat and swallow a camel. Because we strain the gnat, we claim God as our top priority. But without the God priority, we are exposed. If God is life - all of life - then God's priorities must become ours. This means that the time, money and energy spent on other pursuits has to be prioritized alongside caring for the poor, investing in the under-resourced, visiting those in prison, standing with the oppressed, caring for the sick and reaching out to the spiritually lost or confused. Now, church is no longer a cover allowing me to make my short iron game a top five priority. Now, God's priorities must become mine. This is how I must live. This is the life I must teach to and model for my kids. I have been caught. There is no escape, Praise God! I am free! I like your point, very truthful!Keep on preaching and living Christ-centered lives and your sheep will grow! I got a little worried at the start of your posting, but this does make perfect sense. God IS Life and should guide everything else. Thanks for a great way of putting it!